Almost finished model motor glider with an AC motor. Model of nearly indestructible extruded expanded polypropylene (EPP). Rudder, elevator, ailerons and flaps. KIT (only assembled model incl. Brushless motor). New GAMA 2100 at a glance builds on our successful and very popular Alpha 1500. In addition to the simple increase in size (range 2100 mm) are endowed gave her a thorough construction of EPP foam ingeniously paved reinforcements of carbon pipes and flanges; standard control functions (aileron, rudder, elevator, engine speed), we have added the ability to control the flaps. 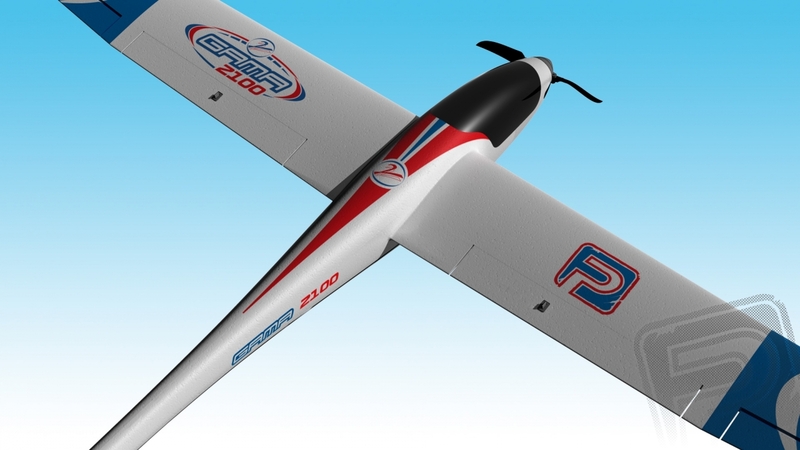 GAMA 2100 because it represents an excellent model for school beginners - is large and therefore easily "readable" in the air is stable and has excellent lubricity - as well as an ideal recreational model, which can further "breed" and without large additional costs to meet the piloting "proper" gliders with advanced mechanization wings. Preserved remains of course proven benefits of Alpha wing with a large bearing area controlled by the ailerons, rudder and elevator, powerful AC motor drive. Robust - yet very lightweight - construction of EPP foam with carbon reinforcements ensures excellent resistance to damage in a crash, or at least very easily repairable, if any damage already there. To operate you just basically even the most ordinary four-channel radio system - of course, to take full advantage of the model is good to use six or seven-channel computer transmitter with mixes for glider with 4 servos in the wing. Power ensure normal Li-Po tříčlánek 1500-2700 mAh - again, nothing challenging, it has today everyone. GAMA 2100 is simply a model that will grow with you - from the first steps with a common čtyřkanálem to enter the world of high performance sailing "orchid" with advanced computer radio. 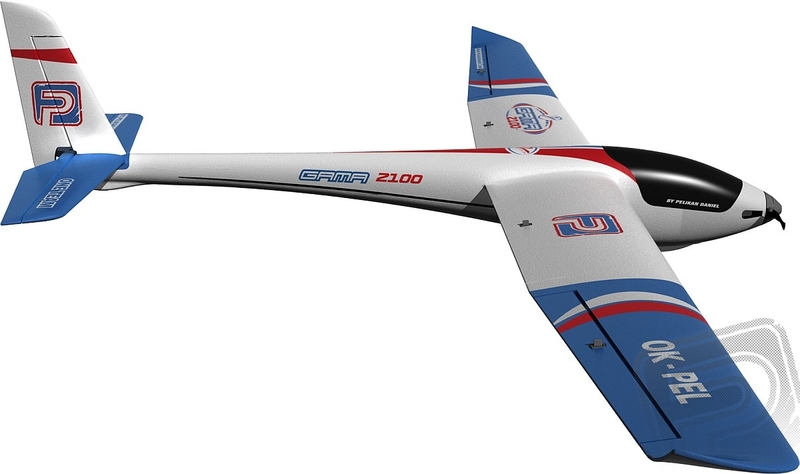 GAMA 2100 is a powerful motor glider made from high grade extruded polypropylene EPP driven by an AC motor. The hull fitted with a motor (outrunner, C2835, 1000 rev. / Min to V) is extracted from EPP foam, solid "backbone" of the fuselage is a carbon tube. Canopy is removable with magnetic closures. The propeller is reclining, with turbokuželem with openings for cooling air in the middle. Cooling motor, controller and battery helps more cooling air inlets on the sides of the nose, necessary outlet for heated air vents are on the sides of the hull in the area under the wing. 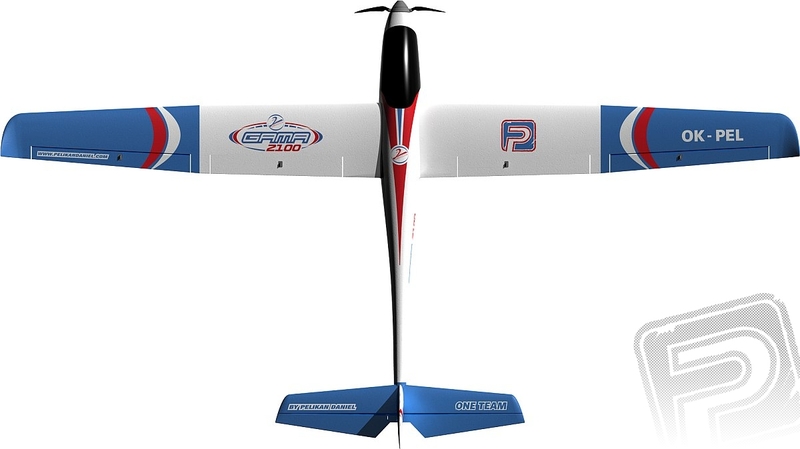 Two-piece wing with the proven "soaring" profile is also molded from EPP, ailerons and flaps (reinforced carbon flanges) are ready to control 2 servos pairs stored in the wing with a short straight wire rods. Wing halves are joined two carbon pipe connections; releasing halves of the wings in flight prevents the plastic clips "nacvakávané" on the clutch. The shafts of the servos are already in pre-stamped wing, servo brackets with handles and levers are part of the delivery model. 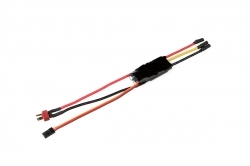 To control the ailerons use two micro servo with a pull at least 2kg.cm (eg HS-81, HS-82MG, HS-85BB, etc. ); 2 servos for the flaps of the same strength, but of smaller size (eg HS-65HB). The tail surfaces in a classical arrangement are made of EPP, are controlled by means of wire cables. The elevator is again reinforced carbon flange. To control the rudder elevator you will need two micro servo with a pull at least 2kg.cm (eg HS-81, HS-65HB, etc.). Preparing to fly the model in the standard version only includes mounting tail (gluing medium glue), deployment of wing halves and connect the drive battery. Controlled by the ailerons, rudder, elevator and motor speed. To control the model you need at least a four-channel RC kit (if you are happy with just to control the ailerons, rudder and elevator), but to take full advantage of the model is suitable to use at least a six-channel computer radio system (in this case, the servo flaps involve using the Y-cable one channel receiver), or better yet, at least seven-enabling to connect and set all servos separately. To control the motor speed controller, you will need at least 25 A (sampling engine with propeller 10x7 "supplied in the kit is 18-20 A) with a powerful stabilizer switched SBEC enabling power onboard electronics with six servos (SPIN 33, FOXY R-45SB). If you want controlled flaps (connect only 4 servos) make do with a normal controller 25 A (eg FOXY R-25B). Another option is to use common control with linear BEC and receiver and six servos powered by an external power stabilizer (eg FOXY UBEC 3A). For the power you need GAMA 2100 Li-poly battery 11.1V with a capacity of at least 1500 mAh. Model without problems "can carry" tříčlánky until about 3300 mAh, the optimal set of 1800-2700 mAh. GAMA 2100 is designed for beginners - as always supply - under the supervision of an experienced pilot, as well as for anyone who wants just so beautiful holiday travels. Flight characteristics are pleasant, straightforward and accurate control of the model. Model will acquaint you with full control of the model around all three axes coordinated control with the right rudder, ailerons and elevator. This experience is "like finding" no later than right after you start flying with their first aerobatic model or even greater glider. Even if you do not have a computer radio system, changing the ratio of the lengths of servo and rudder deflections can adjust the size of a large range. Beginner, start with small, safe and excessive "steerage"; experienced pilot sets the size, allowing a little bit of that basic engine-větroňové aerobatics - loops, barrel rolls, headland turns go game with a little help from the engine very easy and good! The power is sufficient for sustained climb at an angle of about 30-40 degrees, so to gain sufficient height for catching thermals will not be long! GAMA 2100 is sensitive even to weak thermals easily with the precise control about all axes settles into the rising stack of small diameter. And with controlled flaps it will still completely different story! ARTF includes: body molded from EPP with mounted AC motor, folding propeller 10x7 ", molded EPP wing, tail of EPP, 2 carbon tube wing joiner, accessory kit and detailed instructions for building and flying. Gens ACE LiPo - 3S 1800mAh 11.1V 3S1P (40C) lithium-polymer battery pack with max burst discharge 80C. This battery is suited to the following models: foamy airplanes, 1/16 or 1/18 scale mini car, small helicopters, etc. Lipolový battery with a charging current up to 5C for use in most recreational model aircraft and helicopters.